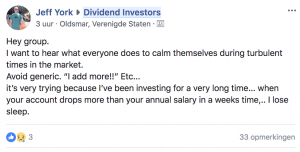 This morning I answered a question in one of the dividends investing facebook groups I’m in. A dividend investor that is getting a bit afraid in turbulent times. I totally understand his fear. It’s scary to see your net worth go down. I had to fight those same demons. You are in a panic and tempted to sell everything. But try to remember why you started with dividend investing in the first place. What was your goal when you started out? For most Dividend Investors it is being able to live on their dividends. Financial Freedom! So does the value of your stock portfolio actually matter then? What matters is the amount of income you get from it. So that is the single thing that I focus on. My monthly dividend income. I have a whiteboard and every single month I write down my passive dividend income for that month.. Put your focus on passive income and you will see a lot of things happen. You will experience peace of mind seeing that continuous growth towards financial freedom. The growth rate can almost pinpoint the moment you will reach your goal of financial freedom. You will make better investment decisions. When you focus on income, you will buy more when the stock market is down as yields will be higher.